Just brainstorming here, but how would you feel about a hero with dissociative identity disorder that has different powers based off of the dominant personality? Maybe limited to two personalities even. Sounds excellent, glad to have you aboard! Got any looks in mind for them? Moon Knight is the hero I'm drawing inspiration from, however I dunno if I'm gonna use this look. It depends what I can come up with, power-wise, as they would have to be unassociated with one another. The two personalities would essentially be "the Hero", and the "Alter Ego". Nice! I've never read the multiple-hero persona run of Moon Knight, but I did catch the more recent one. He'd be a cool addition to the canon. The multiple-power thing was sort of off the top of my head, but his multiple personalities were always really interesting to me. 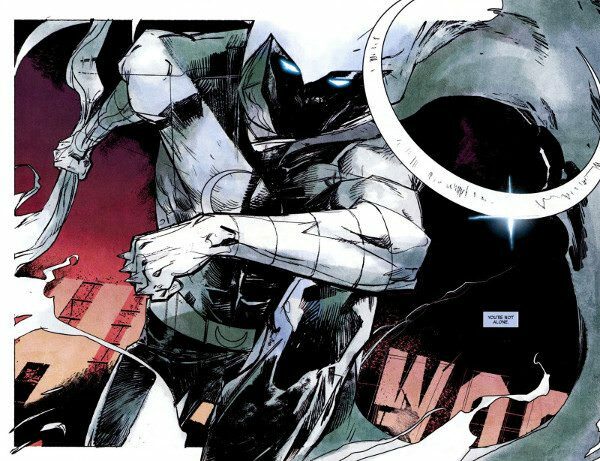 Moon Knight is freakin' buff in a lot of his pictures which is why I'm hesitant to use his image, but damn he looks cool. Yeah, depends on what you're shooting for tonally. One of the things I really want to get across is how hard it is to be a superhero - if you get hurt, where do you go if you have a secret identity? What level of martial arts training could truly prepare a person for a drone strike from the US Government if they decided to interfere in politics? etc. That's why I'm putting the focus on institutions, I guess. Private corporations, tax-funded super squads, and the shadiness of Stranger-type vigilantes will all play into how the plot develops. Honestly that's what drew me in to begin with. The potential for everything to come crashing down all around everyone, and the people that get caught in the middle. Interesting from a drama perspective. I think this character would fit into the Stranger-category, but if I go with someone else i'd love to be in a group of some kind. Most of the challenge comes from deciding the abilities that aren't too over the top, while also making sense from a background perspective. For example his alter ego is either going to be an actor, or possibly a barista for some local shop, nonconfrontational, nice, with possibly a secondary ability, and the hero personality would be the opposite, with dominate abilities, like strength, agility. The personalities wouldn't share abilities. Cool take. Whatever it is, I look forward to seeing it. One thing I'd recommend is that he find some way to operate on a more global scale, given the main themes. Crime-fighting won't even really factor in to the primary narrative, which will be mostly open-ended but on a larger scale. Awesome, I'll take that into account. Whatever I decide, I'll try to have something soon. Is there a specific number of participants you're hoping to gather before you start? I'm planning on leaving it open to join throughout. Gonna be an extended series of story arcs. Consider me interested, though I might be spotty in my commitment. Have an idea for a borderline [if not fully] evil character, and I'm not sure where'd he fit, or if you'd be accepting antagonists.